The long awaited patch 1.31 has arrived. This patch introduces many highly anticpated features to the World Editor. As always, with any patch on the Public Test Realm, please try to extensively test all of the features and report any bugs you may encounter. Native damage detection and modification. Object modification system API allows new changes to many items, abilities, units and more at run-time. Added Custom User Interface functions to allow map makers to add, remove, and adjust UI frames. Folders can now be nested in the Trigger Editor. Tooltip previewer in the object editor. You can find the complete patch notes for Patch 1.31 here. A new website has been created in order to streamline the feedback process for Warcraft III. It's completely optional, you can still voice your opinions in the patch discussion forum, but we hope the new site will help the developers get a better idea of what people actually want. It's still in Beta but the website will be gradually improved over time. By voting for suggestions you can attract attention to the most wanted features, so they will be pushed to the top. configuration file improvements, allowing for further code-based map metadata customization, and also laying additional groundwork for the independent map generation pipeline we envisage for the future of wurst. to the standard library: a new damage detection and modification API, which supports and uses the new 1.29 natives. configuration workflow. You can now modify scenario data such as players, teams, and loading screens, all without opening the world-editor. See the Tutorial for more information. The WurstSetup received a face lift, including auto-update, better async tasks, and complete CLI functionality for power users. expressions are now retained for use during runtime. statement with joined cases, duplicate case detection, and control flow improvements. Annotations must now be properly defined to not throw a warning. Experimental support for @LeP's "hot code reload", which enables code modifications while the map is running. executions can now be customized, allowing for the creation of a timer dialog. has been cleaned up and fixed. can now be fully configured. now only listens to mouse events if those events are used. no longer generates default unit order strings, so they can be distinguished in events. to make any ability castable by a dummy caster. dummy units can now be accessed via the dummy caster API. Fixed nested indexing/deindexing in UnitIndexer. Fixed counted callbacks not stopping properly in certain cases. , and improved image documentation. instances being executed incorrectly and now permits destroying instances directly. Added further - and improved existing - standard library documentation pages. We also recently rolled out a new tutorial on closures - be sure to check it out. Webpage interface breadcrumbs for tutorial, stdlib, and blog posts now include all parents. Our domain is now verified on GitHub. Legends of Arkain - Second Orc Book released! The Second Orc Book of the Legends of Arkain, a hosted series of campaigns by Shar Dundred, was released this week. Following the events of the First Orc Book, this campaign starts with the Orcs on the run. The Redfist led by Duke Volarian Redfist the Tyrant, the father of Aedale and Cora Redfist from the First and Second Human Books, intends to burn everything that either looks orcish or is either allied or even neutral towards the Orcs to the ground. The remaining regiments of the severely weakened Imperial Army have been assigned to the command of Commander Daric and his strong mercenary army. In service of the Empire, they have been charged with the task of hunting and killing every single Orc they can find. Against these impossible odds, the Orcs have to adapt in order to survive the onslaught. Alone, they stand no chance. Allies must be found to help them survive this new tide of enemies for otherwise, it will drown the Orcs clans in their own blood. Are you up for the challenge? Download the Second Orc Book and prove yourself against your new enemies! And a special ending may be waiting those who slaughter everything. In May 2017, The Hive Workshop ran a paired modeling/texturing contest where 6 teams competed for the best leader unit. While entries ranged from sci-fi to comical, it was the Mo'arg Overlord by FerSZ and Murlocologist thatcaptured first place. Today, the Mo'arg Overlord commands a strong presence. He's got a 5.00 rating and boasts an army of 6500+ minions (or downloads). With all the care FerSZ and Murlocologist put into the unit, it's not hard to see why. The Overlord looks impressive and imposing while coming with over a dozen animations including attacks, spellcasting, and victory poses with really nice particle effects that I wish I was able to capture in the previews below. Add him to your ranks and no minion will ever disobey you. You can hire him from here. One of our goals this year is to start up these spotlights once again. There are many projects available and we want to show off the higher quality ones. Expect to see more awesome projects next month. If you have any recommendations on any projects that you feel should be showcased, send me a message. With it brings a bunch of exciting features including a minimap and dark UI theme, along with updates like fully functional undo/redo and a JASS editor. No longer do you have to endure a bright World Editor. As always, make sure to backup your maps before diving in. 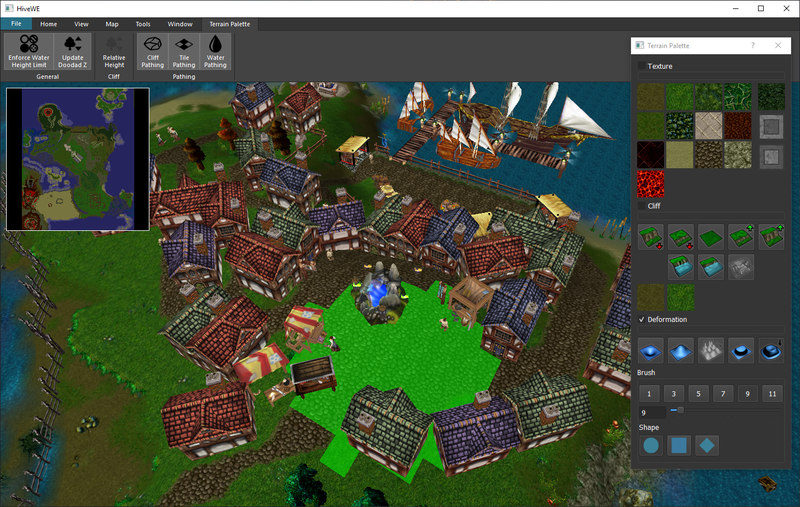 For those unfamiliar with HiveWE, it's an open-source third-party Warcraft 3 map editor being created by Eejin. You can find more information about it on the resource page. Read all the changes and download the latest version here!